One of the gifts on our wedding registry that I was super excited about receiving was a sous vide. With its help, I’ve finally mastered the perfect filet mignon, made an amazing pork tenderloin, and effortlessly prepared the most flaky and moist salmon filet. I’m basically obsessed with the sous vide now. In French, sous vide translates to “under vacuum”, referring to the process of vacuum-sealing food in a bag, then cooking it to a very precise temperature in a water bath. This technique is amazing because it makes it virtually impossible to overcook your food. Making it perfect for cooking a delicate cut of meat, like filet mignon. But, I also love the sous vide process because it’s basically a set it and forget it technique. You just drop your food in the water bath and let it cook away. Because I love the sous vide process so much, I’m constantly on the lookout for new recipes to try. Which is why I was so excited to discover Sous-Vide Magazine. 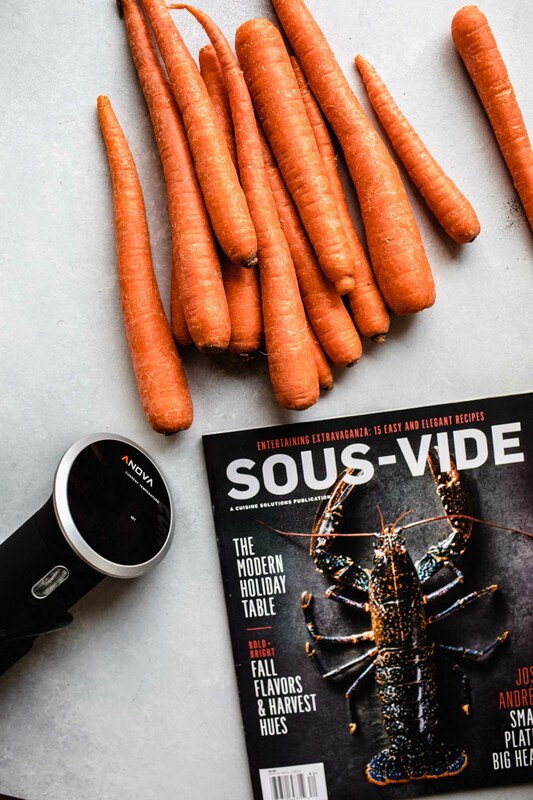 Not only is it packed full of creative and delicious new sous vide recipes to try, but it’s also got some great articles. I loved their tips on creating a modern holiday table scene and they even spotlighted some of my favorite spots to visit in Portland. 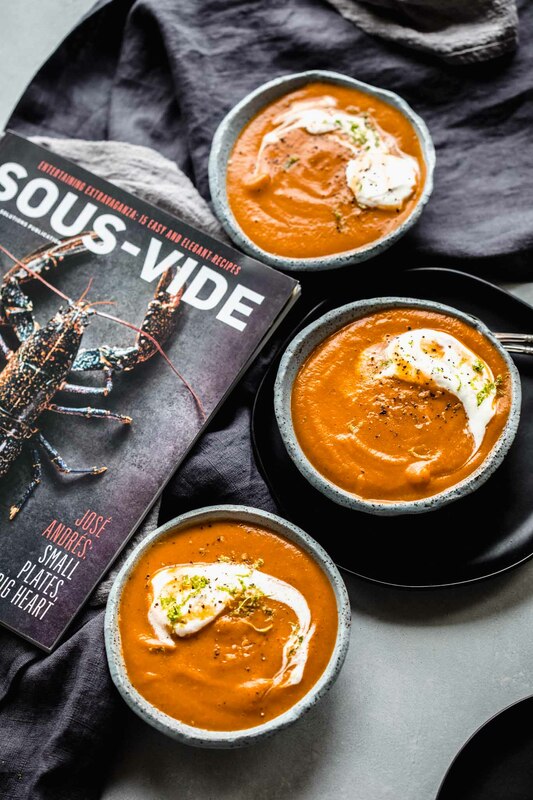 But the recipe that most caught my eye in their Fall/Winter Issue was the Carrot Soup with Smoked Ginger and Whipped Cream. I hadn’t yet tried the sous vide process with vegetables and I figured that this recipe was the perfect one for me start with. Not only did their beautiful photographs draw me in, but the smoked ginger really intrigued me as well. How Do You Make Carrot Ginger Soup? To start the cooking process, place your sous vide in a vessel that’s large enough to hold enough water for your bag to be fully submerged and deep enough to ensure that the water level falls between the minimum and maximum level indicators on your sous vide circulator. Heat it to temperature while you prepare the vegetables. You’ll need to cube a couple yukon gold potatoes and peel and slice a couple pounds of carrots. Add them to your sous vide bag along with some onion, garlic and spices – cardamom pods and allspice. Then, just let it cook away for about four hours. I did veer from the original recipe in just a couple ways. First, I forgot to plan ahead on curing the smoked ginger. The recipe calls for the ginger to be marinated with a bit of liquid smoke and salt and pepper for 8 hours. I found that just a quick cure time of 30 minutes did the trick. Second, while the original recipe calls for the soup to be strained after blending, I didn’t find that step necessary. The soup was deliciously smooth and creamy straight from the blender. 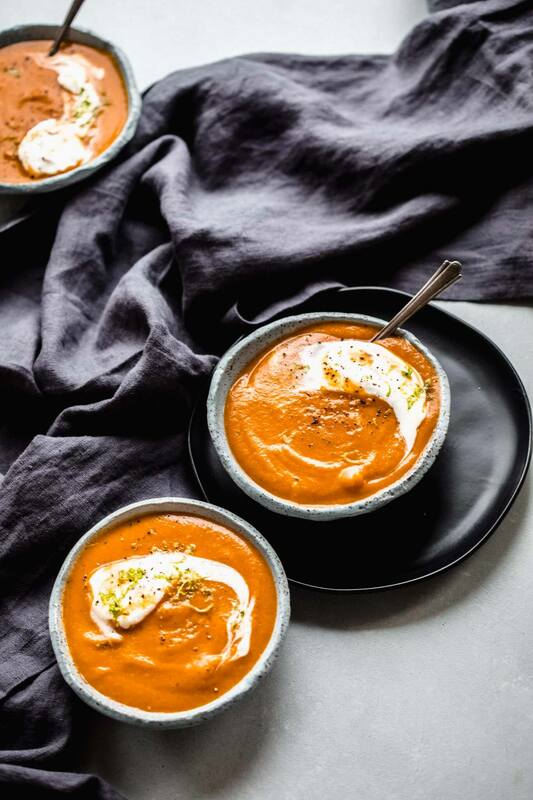 Topping these beautiful bowls of bright orange Carrot Ginger Soup with that light and fluffy whipped cream and a sprinkling of lime zest made for the most stunning presentation. I’d be just as happy to serve this soup at a fancy dinner party as I would for a casual dinner on the couch with Netflix turned on the background. In a small mixing bowl, combine salt, sugar, and pepper. Firmly press the rub into the sliced ginger (extra spice rub may be saved to season soup, to taste). Next, place the ginger into a sous vide pouch, add liquid smoke, and seal. Allow the ginger to cure for eight hours, or overnight for more flavor intensity. Once cured, remove the ginger from the bag and reserve a few slices for garnish. Set the circulator to 181.4°F (83°C). Combine the ginger and all ingredients except stock in a large sous vide pouch. Seal and cook for four hours or until vegetables are tender. Once done, remove and transfer hot vegetables into a high-speed blender. Gradually add the stock until the soup has a smooth consistency. While blending, season with reserved ginger-curing spices to taste. Once the soup has reached the desired texture, strain through a chinois. Place all ingredients into a mixing bowl and whisk until stiff peaks form. Serve in a soup bowl with a dollop of whipped cream and garnish with julienned smoked ginger and lime zest. 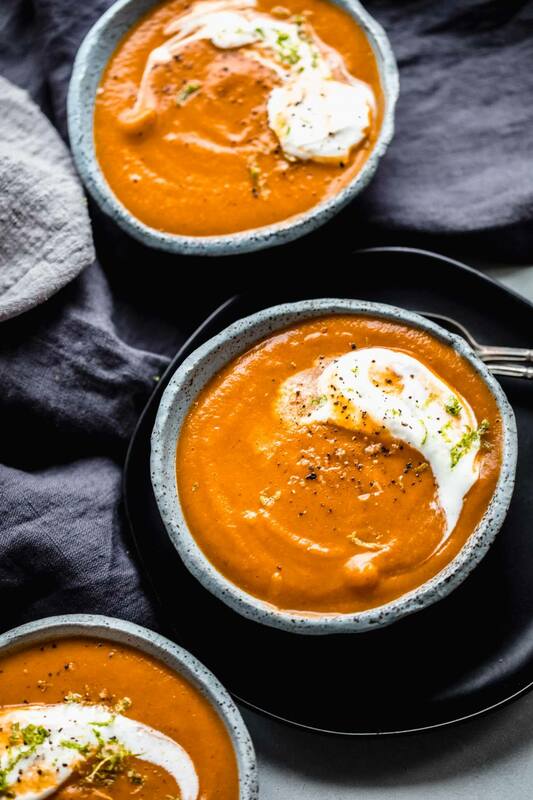 If you loved this Sous Vide Carrot Ginger Soup recipe I would appreciate it so much if you would give this recipe a star review! Also, be sure to snap a picture of your finished dish and share it with me on Instagram using the hashtag #platingsandpairings and tagging me @platingsandpairings. I teamed up with Sous-Vide Magazine and Cuisine Solutions to bring you this post. As always, all opinions are my own. Gewürztraminer makes a great pairing for this soup. With a weighty mouthfeel, and a delicate sweetness, it works really well with this creamy, savory soup. Looking for more sous vide recipes? Try this Sous Vide Filet Mignon. Yum! 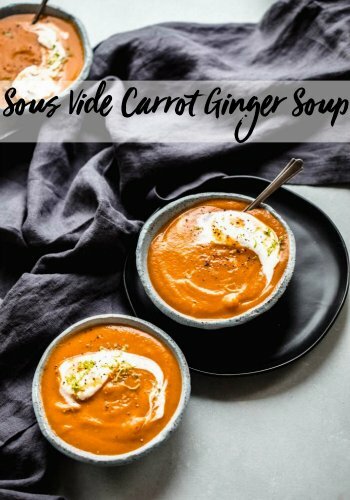 I make plenty of blended soups during this time of the year, and there’s a curried carrot soup that I really enjoy, but this recipe with ginger sounds amazing. The color is gorgeous too! Good thing I read this post because I actually didn’t know what sous vide meant. I thought it only had to do with eggs! Thanks for the context and the recipe. This is the perfect day for this! Cannot wait to try this. I can’t wait to try this. I love our sous vide! This soup looks amazing but also: those bowls! Love! I keep meaning to get a sous vide because I hear it’s the best way to cook meat. Now I also want the magazine — looks like gorgeous inspiration! I was really amazed by the magazine – So beautiful, very well written and a good variety of content. This looks beautiful and I’m sure the taste matches! Hi. Can you recommend a stove top version of the recipe? Sure! I would first saute the onions in the oil, until they’re soft, about 5-6 minutes. Then add all the other ingredients, bring to a boil, and simmer 30 minutes. You may need to increase the amount of stock to at least 3 cups to be sure that the potatoes and carrots are fully covered while they cook. Hope that helps!